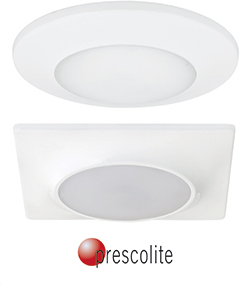 The LBSLEDA LED is an alternative to recessed products in settings where plenum height is a challenge or where fire codes restrict the use of recessed fixtures. The fixtures are available in 7-inch round and square versions and feature a snap-in system that makes flush mount installations easier. The fixture also includes an E26 Edison base adaptor for a retrofit screw-in option and an optional mounting kit that allows for installation into 4-, 5-, or 6-inch recessed cans.